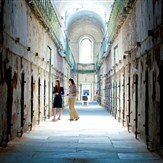 Opened in 1829 as part of a controversial movement to change the behavior of inmates through "confinement in solitude with labor", "Eastern State Penitentiary" quickly became one of the most expensive and most copied buildings in the young United States. Some of America's most notorious criminals were held in the Penitentiary's vaulted, sky-lit cells, including bank robber Willie Sutton and Al Capone. After 142 years of consecutive use, Eastern State Penitentiary was completely abandoned in 1971, and now stands, a lost world of crumbling cellblocks and empty guard towers. We will have a guided tour of the Penitentiary and then you will have some free time to do a little more exploring or visit the gift shop. Free time at Historic District for dinner on your own will be given before we meet our guide for a Ghost Walk. Experience the chilling tales of Americas most historic and most haunted city on a candlelight walking tour of Independence Park and Society Hill. Note: This is NOT the Terror Behind the Walls attraction at the Penitentiary!!! Children under seven years old cannot be admitted to the Eastern State Penitentiary. Please dress in weather appropriate clothing. The floors of the ESP are Stone and occasionally uneven. We do not recommend wearing sandals or open-toed shoes. Ghost walk is less then 1 mile and goes rain or shine. If weather conditions become severe the ghost walk tour may be cancelled.